As entries start to stack up for the gruelling 340km uBhejane Xtreme MTB Challenge on Saturday 8 December, Olympic medallist Terence Parkin has upped the ante substantially by targeting the first ever “Ultimate” uBhejane ride of 570km with Durban rider Dave Duke. 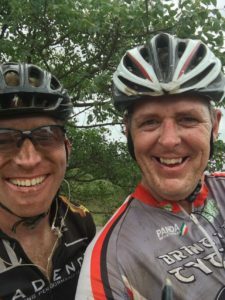 The pair will start the newly added three day uBhejaneX ride from Hillcrest to Hluhluwe’s Hilltop Camp, and after completing the first two days and 230 kilometres they will return to Hillcrest to join the rest of the riders for the one-day 340km trek to Hluhluwe. 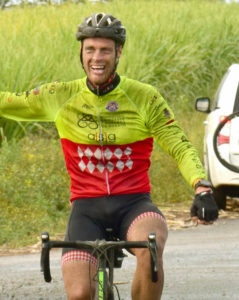 Parkin, who is deaf, is no stranger to ultra-distance events, having completed a 902km ride for the Princess Charlene of Monaco Foundation that started cycling in Johannesburg and ended with multiple Midmar Miles and finished with the FNB Dusi Canoe Marathon in 2018. Parkin said that he was passionate about supporting rhino conservation, and said his motivation to take the tough 340km ride and balloon that distance to 570km over three days was his growing outrage at the ongoing rhino poaching. Parkin is in great shape as he trains every day, clocking long hours on the bike every week. Parkin was approached by another ultra-distance rider Dave Duke, who has been part of every edition of the uBhejaneX since its inception, and the duo quickly hatched the plan for the first ever uBhejaneX Ultimate ride of 570km. “My wife has signed up for the three day ride, and is feeling pretty nervous about it,” said Duke. “That’s when I decided to look into doing the first two days of the three day ride to support her and then come back to do the full 340km ride. “I needed a wing man. Terence is as mad as I am and he jumped at it,” he added. “He is such a great athlete and a humble gentleman. And he is as tough as nails. So I know what I am in for with him. “I am like Terence. The harder the better,” said the 49 year old Kloof resident. “Growing up in KZN, I visited Umfolozi and Hluhluwe many times enjoying the wildlife as it should be – left alone,” says Duke. “Poaching and hunting is something I just cannot fathom. The uBhejaneX dreamt up by Mark Carroll is brilliant. I have ridden this ride four times and it is one helluva day on a bike. “But to finish this and relax at Hluhluwe on the Saturday night with fellow riders and organisers is an absolute treat and one of the highlights of my year,” eh added. The ride has extra significance for Duke as he pays tribute to a friend Neil Taljaardt, who rode the full 340 km ride while battling cancer in 2016. “It was his last ride while he was battling with cancer. He rode strong as ever and then lost his battle in January of 2017. His photo is on the back of the race shirts with the ‘Never ever give up’ slogan,” says Duke.